The Avenue of Trees in Martin Street, Penshurst between Ritchie and Cox Streets was planted in the early twentieth century to beautify the town. They are of interest for their mixed plantings in what is an unusual sequential pattern reflected between the cross streets and identical on either side of Martin Street. It may be that the pattern was influenced by the eminent landscape designer, Hugh Linaker who is known to have promoted such a pattern. The species are Ulmus, Schinus and Platinus. The avenue of trees is in fair condition, with reduced integrity due to the loss of several trees from the pattern. The Avenue of Trees in Martin Street is of aesthetic significance to the township of Penshurst. The Avenue of Trees in Martin Street is of aesthetic significance for their unusual pattern of planting, for reflecting a municipal desire to beautify the town and for their important contribution to the streetscape of Penshurst. The surviving trees are fair condition. 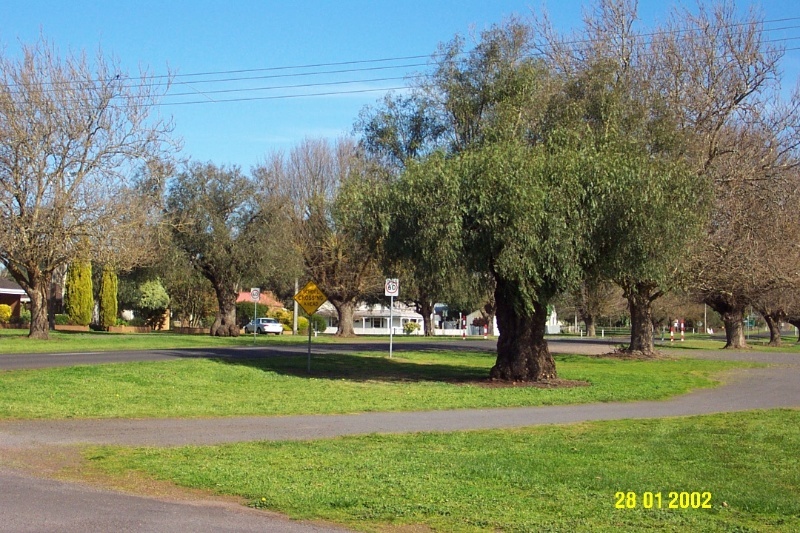 An avenue of trees are planted in the grass verges of Martin Street from Ritchie Street to Cox Street in the township of Penshurst. These trees are planted in a systematic alternation to form an A B C B A rhythm. The specimens in this pattern are Schinus molle (peppercorn), Platinus x acerfolia (London Plane) and Ulmus procera (English Elm). The trees are planted to match each other on opposite sides of Martin Street. There are some trees missing, particularly outside the public buildings on the west side of Martin Street between Bell and Cox Streets. It appears that primarily those trees which are missing are specimens of Schinus molle (peppercorn). There are no plaques to suggest that this avenue is a memorial planting or a commemorative celebration planting. Good degree of integrity but several trees are missing.